The SES-14 communications satellite, shown here in an artist's illustration, successfully deployed after its launch on an Ariane 5 rocket on Jan. 25, 2018, despite Arianespace losing contact with the rocket's second stage. NASA's atmosphere-watching GOLD mission is flying along with SES-14. The satellite company SES confirmed that its SES-14 communications satellite, which hosts an upper-atmosphere-observation mission from NASA, will be able to reach its final orbit just four weeks late after a launch anomaly saw the rocket lose contact with Earth last night (Jan. 26). Although Arianespace was unable to communicate with the Ariane 5 second stage carrying SES-14 and another satellite, Al Yah 3, into orbit, the satellites were still successfully released — and each got in contact with its respective control center, Arianespace representatives said. 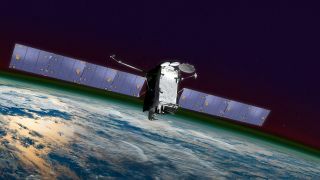 The Global-scale Observations of the Limb and Disk (GOLD) instrument was NASA's first-ever science mission to fly as a hosted payload on a commercial satellite, NASA researchers have said. SES representatives said in a statement today that the company is now setting up a new orbit-raising plan, which will take SES-14 and GOLD to their final orbit four weeks after this was scheduled to happen; the satellite was slated to take four and a half weeks to maneuver into its high orbit using electric propulsion. Once they reach its final geostationary orbit, SES-14 and GOLD will remain in position above one spot on Earth as they circle and the planet turns. This will let SES-14 support communications for Latin America, the Caribbean, North America and the North Atlantic region, SES said, and it will give GOLD an ideal vantage point to monitor the rapid flux of the upper atmosphere at the border between Earth and space. "SES confirms that the spacecraft is in good health, all subsystems on board are nominal and the satellite is expected to meet the designed lifetime," SES representatives said.